Beautiful Autism Awareness Bracelet. 8 inch long sterling silver .925 plated chain finishes with a beautiful heart lobster clasp. The colorful beads are faceted glass crystals. Antiqued silver tone metal puzzle piece beads and unique puzzle heart bead with tiny puzzle piece drop with LOVE inscription. Chain is 3mm thick and has a screw on attachment at one end to add or remove beads as you wish. 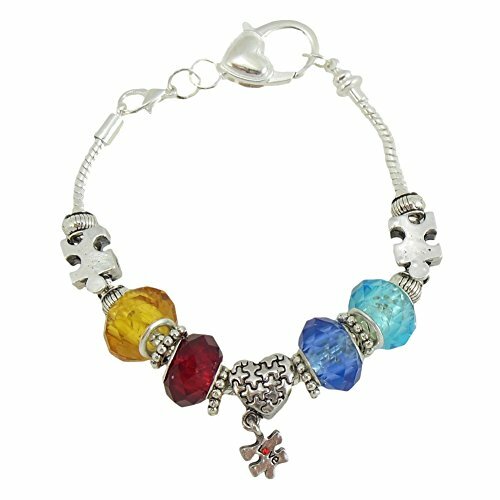 It expresses all the Autism Awareness colors and has several spacer beads for added texture and eye appeal. This bracelet comes in a gift box and is wrapped in an organza bag ready for gift giving.